Transparency Market Research (TMR) has published a new report titled, “Teleradiology Services Market - Global Industry Analysis, Size, Share, Growth, Trends, and Forecast, 2018–2026”. According to the report, the global teleradiology services market was valued at US$ 4,607.8 Mn in 2017 and is projected to expand at a CAGR of 19.0% from 2018 to 2026. Increase in adoption and demand for teleradiology services and rise in the number of radiology procedures are expected to boost the global market from 2018 to 2026. The U.S. is anticipated to dominate the global market during the forecast period owing to increase in adoption of advanced products, early availability of novel medical technologies, developed health care infrastructure, and surge in strategic acquisitions to expand services. For instance, MEDNAX Services, Inc. enhanced its market position by acquiring Virtual Radiologicals (vRad) in 2015. MEDNAX offers vRad’s services and technologically advanced solutions to its existing customers. This acquisition has broadened the company’s service capabilities and diversified the revenue. The market in China and India is expected to grow at a high CAGR during the forecast period. Growth of the market is attributed to rise in incidence rate of chronic diseases, increase in geriatric population, and surge in demand for various diagnostic imaging procedures. The availability of U.S. Board certified radiologists in countries such as India and China, and rise in demand for round-the-clock services by health care facilities located in different time zones are likely to drive the global teleradiology services market. Outsourcing radiology services to well-trained radiologists, who can work for a relatively lower fraction of cost is profitable to the health care providers, according to macroeconomic principles. Hubs are, therefore, emerging in price-sensitive countries in Asia to handle the bulk of radiology reporting requirements. Radiologists providing services to the rich and developed countries are focusing more on improving their role as imaging consultants, which is considered to be a value addition to patient care in certain cases. This is the major factor likely to drive expansion of teleradiology services in the next few years. The report offers detailed segmentation of the global teleradiology services market based on services type. In terms of services type, the general reporting segment is projected to account for the largest share of the global market during the forecast period. Dominance of the segment is attributed to rise in demand for time-saving and cost-effective radiograph interpretation by health care providers across the globe. In terms of coverage, the global teleradiology services market has been segmented into day time and after hours/night time. After hours/night time is projected to be the most attractive segment during the forecast period. Rise in sophistication in the diagnostic imaging platform which enables emerging countries to provide 24*7 teleradiology services to clients is likely to propel the segment during forecast period. Based on specialty, the global teleradiology services market has been segmented into cardiology, neurology, oncology, musculoskeletal, gastroenterology, and others. The neurology segment is projected to lead the teleradiology services market in 2018. Dominance of this segment during the forecast period is attributed to rise in outsourcing of neurology scans due its complexity and difficulty in reading, as it requires highly specialized radiologists to read neurology scans. In terms of modality, the computed tomography (CT) segment is projected to account for dominant share of the global teleradiology services market during the forecast period. The segment is likely to expand at a CAGR of 20.0% from 2018 to 2026. Major share of the segment is owing to its ability to distinguish between 2000 levels of density, enabling the doctor to visualize 3D structures in the body for accurate diagnosis. In terms of end-user, the global teleradiology services market has been segmented into hospitals, diagnostic imaging centers, ambulatory surgical centers, clinics, and others. The diagnostic imaging centers segment accounted for the major share in 2017, accounting for 30.0% in terms of revenue. This is because diagnostic imaging centers offer a one stop shop for all imaging requirements, making it a preferred choice for patients. This is expected to boost the segment from 2018 to 2026. The hospitals segment is anticipated to expand at a higher CAGR during the forecast period due to quick service, high-quality, and competitive pricing. Geographically, the global teleradiology services market has been segmented into five major regions: North America, Europe, Asia Pacific, Latin America, and Middle East & Africa. 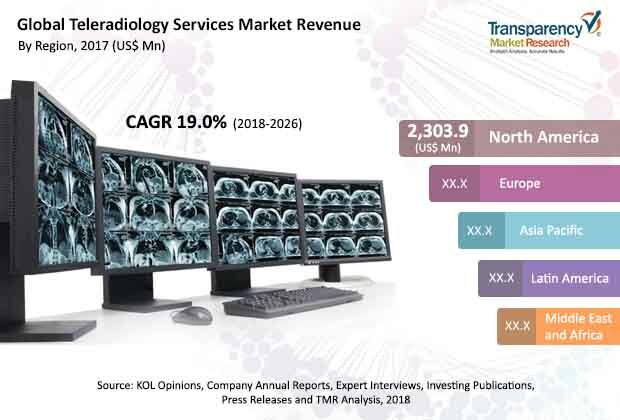 In terms of revenue, North America is likely to continue to dominate the global teleradiology services market during the forecast period, owing to a highly developed health care sector, increased awareness among patients, and continuous evolution of information technology. The region offers immense growth potential in teleradiology service market. The teleradiology services market in Asia Pacific is anticipated to expand at a significant CAGR of 22.0% from 2018 to 2026 due to increase in awareness about teleradiology and growth in the health care sector in countries such as China, Japan, and India. Moreover, technological advancements and rise in adoption of teleradiology solutions are expected to propel the market during the forecast period. The global teleradiology services market is highly fragmented in terms of number of service providers. Key players contributing to the growth of the global teleradiology services market include Envision Healthcare Corporation, MEDNAX Services, Inc., 4ways Healthcare Limited, Euro American Tele Radiology, Argus Radiology, Teleradiology Solutions, American Imaging Consultants, USARAD Holdings, Inc., ONRAD, Inc., Teleconsult Europe, Africa Telerad Limited, and Unilabs. These players have adopted the strategy of inorganic growth through partnerships, collaboration, and expansion. For instance, on November 13, 2017, Unilabs acquired Telemedicine Clinic (“TMC”), a leading provider of teleradiology and telepathology services in Europe. This acquisition accelerated the development and implementation of digital processes in radiology and pathology, which will enable the company to offer more sub-specialist reporting from top experts in their field to end-users.